You can customize the font, size, or color of overdue or completed tasks so that they stand out in the Tasks view. Note: The appearance of task items in the To-Do Bar cannot be changed. On the View tab, in the Current View group, click View Settings. 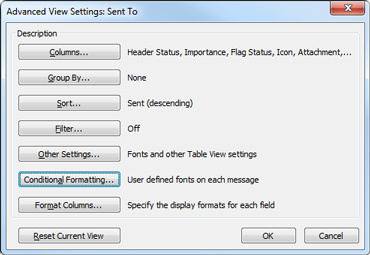 In the Advanced View Settings dialog box, click Conditional Formatting. A set of default rules appears. To change the appearance of overdue tasks, click Overdue tasks, and then click Font. To change the appearance of completed and unread tasks, click Completed and Unread tasks, and then click Font. To change the appearance of completed and read tasks, click Completed and Read tasks, and then click Font.